The largest phylum of creatures on Earth without a doubt is Arthropoda, both in terms of number of species and in total number of individuals. There are nearly 1 million species of Arthropods, with over 90% of them being insects. Of the remaining less than 10%, or about 85,000 species, there are only three major marine groups. The most well known is that of the mostly marine sub-phylum Crustacea (>30,000 species), the entirely marine class Pycnogonida, also called the "sea spiders" (500 species) and the entirely marine class Merostomata, commonly called the horseshoe crabs (5 species). All Arthropods share certain characteristics making them unique from other phyla. Most obvious is the external skeleton (technically, not really a shell). Not only does this exoskeleton protect the animal like a suit of armor, but it actually does serve as the animal's skeleton. The muscles of an Arthropod are connected to the inside of the exoskeleton, because the animal lacks an internal skeleton of any type. The exoskeleton is made of a tough substance called chitin (KIE-tin). The animal secretes this hard material from cells in the underlying epidermis. Because the exoskeleton cannot grow, the animal must periodically shed its armor in order to grow. This process is called molting. The animal must first grow a soft exoskeleton underneath the principal exoskeleton. Then, the animal grows enough within the principal exoskeleton to crack it. The animal then crawls out of its old exoskeleton and allows the new soft one to grow and harden. New exoskeletons are usually too large for the animal at the time of the molt, and the animal must grow into the new exoskeleton. This allows reasonable time between molts. Immediately after an Arthropod has molted, it is quite vulnerable because it is essentially defenseless. During this period, the animal will hide and wait for its armor to harden. Lobsters caught during this period of time are sometimes called "soft-shelled" because they feel noticeably soft. The name Arthropod means "jointed-foot." In order for the Arthropod to move in such a rigid body, it has numerous joints in its exoskeleton. Like door hinges, they allow bending in only one direction, but are surprisingly well developed. A lobster is quite flexible when necessary, and can manage to rotate its claws sufficiently to pinch its captor. Arthropods have what is called an open circulatory system. This means that unlike many other kinds of animals, they have no arteries, veins or capillaries to carry blood. Instead, blood is pumped through sinuses (open spaces) within the animal to reach the tissues. Arthropods also have compound eyes. Most people know of the insect's compound eyes, and the other Arthropods' eyes are no different. Each eye is composed of many smaller light-sensitive organs, called ommatidia. Together, these ommatidia form a single working eye. The compound eye is not specialized so much for detailed sight as for the detection of motion. The crustaceans are probably best known as a source of food. Lobster, crabs and shrimp are all Crustaceans. Barnacles, amphipods, isopods, and copepods are also Crustaceans. Crustaceans have five pairs of appendages. Usually the front pair, called Chelipeds, have claws on them, while the remaining four pairs are walking legs. In many species, the second and even the third pairs of legs have smaller pincers on them as well. While some of the primitive Crustaceans have a single body piece, called a trunk, the more advanced forms (like lobster, crabs and shrimp) have the body divided into two regions: a cephalothorax (or thorax) and an abdomen. The cephalothorax (meaning "head-body") is so called because it contains the "head" as well as the main body organs. The abdomen (which many people erroneously call the tail), on the other hand, is mostly muscular. The abdomen is usually made up of 6 segments, each containing a pair of "swimmerets" (small legs). In the male, the most forward pair of swimmerets are longer than the others, designed for inserting sperm into the female. The last segment of the abdomen ends in a flattened section called the telson. The tailfan is composed of the telson and two flat appendages, called uropods, on each side. 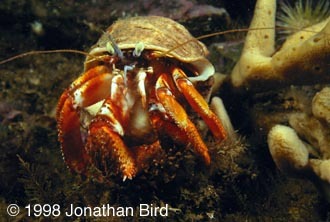 Most Crustaceans are similar in appearance, with the most obvious exception of barnacles. The body form of the barnacle is Crustacean, but it isn't very obvious unless examined at the larval stage. There are about 900 different species of barnacles known. Barnacles contain special glands which produce a type of "cement" which they use to glue themselves to rocks, ships, whales, docks and just about any other hard surface. As barnacles grow, they create their own little "houses," called carina, which look like tiny volcanoes. These are made of calcium carbonate which the barnacles make by combining carbon dioxide with calcium extracted from the water. 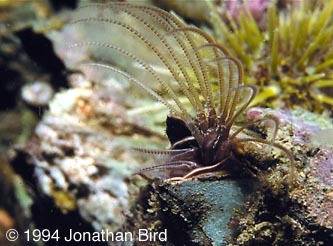 When a barnacle is young, it is a planktonic larva with no protective carina and may become a meal for a larger animal. It must find a suitable place to settle and grow before it can start to produce a carina. Barnacles get their food by waving an arrangement of limbs called "cirri" in the water to catch drifting plankton. The cirri are present on even the larval barnacles--they are the legs. When the barnacle settles down to its adult form, it attaches itself to the substrate by the head and waves its legs to collect plankton. There are only five species contained within the Class Merostomata, and among those, only one is found in American waters. 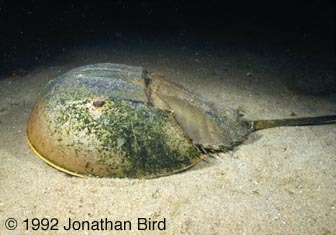 Commonly called the Horseshoe Crab (Limulus polyphemus), it is only found on the east coast of the United States, from the Gulf of Maine to the Gulf of Mexico. It is very common on Cape Cod. The animal is a tannish-brown color, but may accumulate algae growth, to look green in spots. This creature (which, technically, is not really a crab at all, and is more closely related to the spiders and scorpions) has no relatives in the North Atlantic which look similar, and is therefore impossible to confuse with other Arthropods. Circa 1870, the horseshoe crab was given the name "horse-foot crab," which is a better description of its shape than "horseshoe." However, somehow the name became corrupted between then and now. It has a rounded ("horse-foot shaped") carapace, with a triangular abdomen and a long, slender tail called a telson. On Sir Walter Raleigh's expedition to the New World in 1584, naturalists Thomas Heriot and John White noted that the indians used the horseshoe crab's tail (connected to a reed or stick) as a spear tip to spear fish. The mouth is on the underside of the animal and is surrounded by five pairs of walking legs. Each leg is heavily armed with spines on the inside edge of the largest segment. These spines are called gnathobases and are used to grind up food (usually worms, clams and other small invertebrates) before it is eaten. 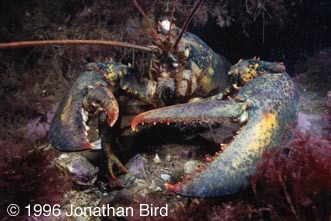 The Northern lobster, found in the northeast United States and Eastern Canada is a culinary favorite. It has large chelipeds more than capable of crushing the snails and clams on which it dines. 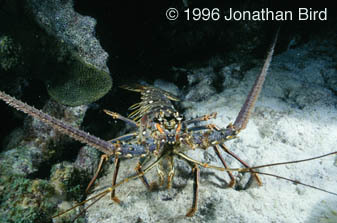 The Spiny lobster, such as this Caribbean species, has no large chelipeds. Instead, it uses long, spiny antennae as weapons. Anyone who has ever grabbed one of these lobsters without gloves has felt the effectiveness of these antennae! 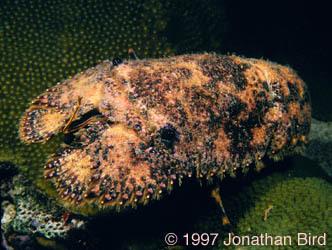 The Slipper lobster looks more like a giant underwater cockroach than a lobster. Its antennae have evolved into flat, shovel-like plates. 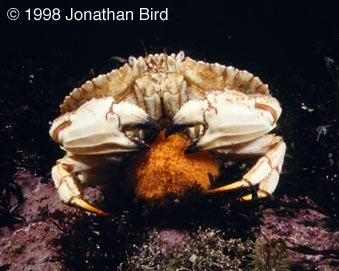 A female Rock crab, found in New England, holds her eggs under her abdomen. The orange ball of eggs contains thousands of baby crabs just waiting to hatch. A Spotted Cleaner shrimp (Caribbean) hides among the venomous tentacles of an anemone, safe from predators. 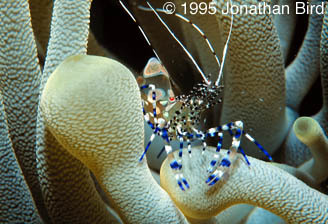 This shrimp uses its chelipeds to pluck parasites off fishes that come to the anemone for a cleaning. The shrimp gets a meal, and the fishes get cleaned. 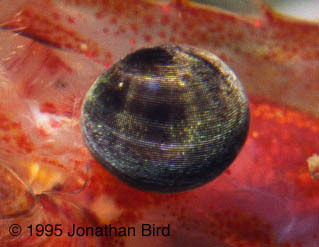 An Acadian Hermit Crab in New England lives in a snail shell. When it grows too large for the shell, it has to find another one. This extreme close up of a shrimp's eye (smaller than a pin head) shows the ommatidia of the compound eye structure. A barnacle is sort of like a shrimp standing on its head with its legs sticking out. The Horsehsoe crab is an ancient animal that has proven incredibly important to medical research.